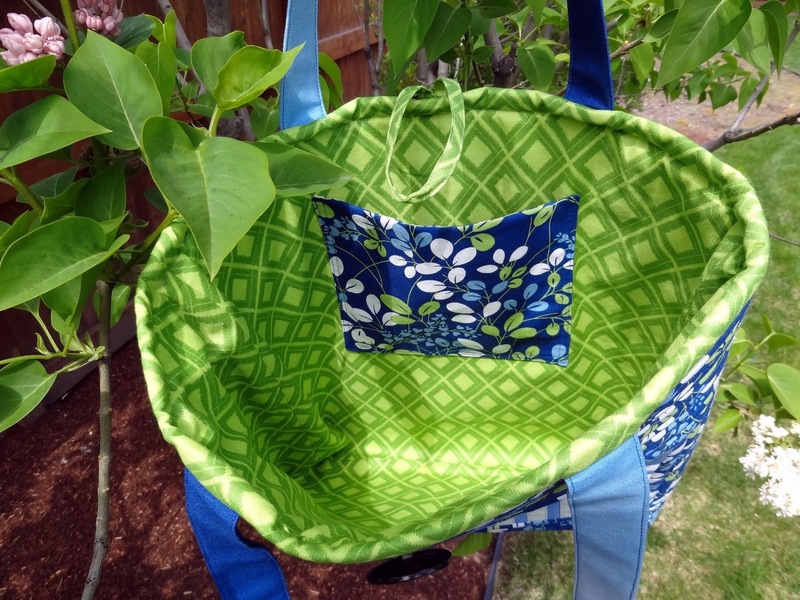 Squash House Quilts: A New Supreme Finish and Giveaway! I love your bag. Great colors. I would make mine out of Alchemy, by Amy Butler. 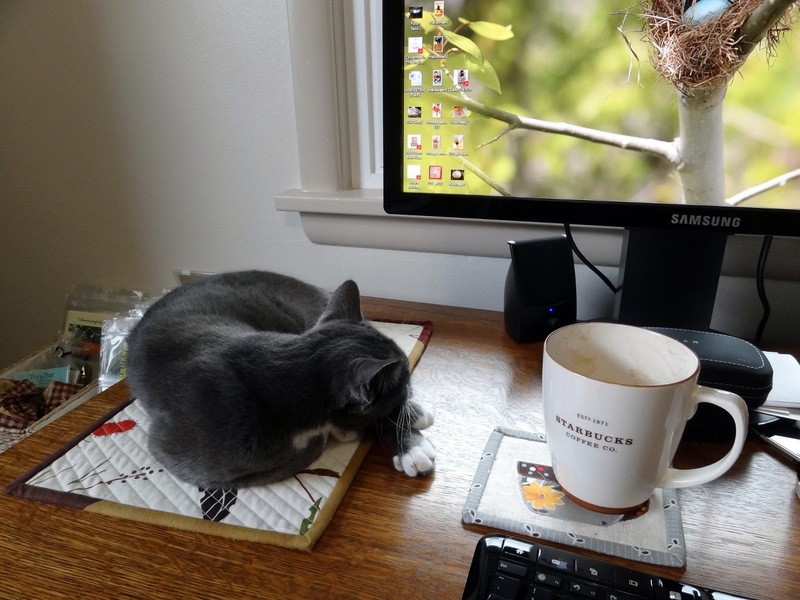 beautiful Spring colors & your helper is adorable! My favorite flowers are daisies. Right now all 6 of my Gerber Daisies have bright blooms on them!! LOVE the fabric and the bag - love Miss sacha more though - what a precious girl ! Oh my, your little kitty is just too sweet! Our cats used to follow the sun around the house all day too! 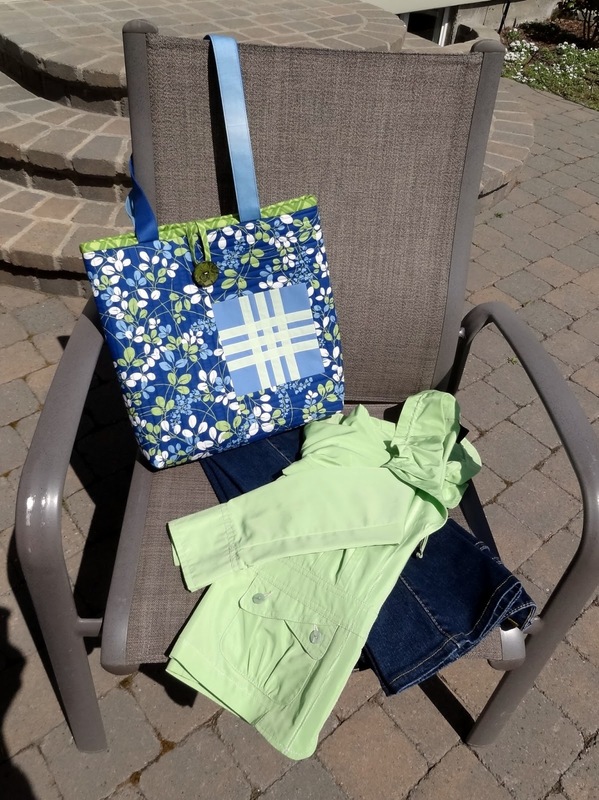 I love your bag and the fabrics you used! My favorite spring flower would have to be the happy daffodil...they just make me smile! Candace - can you believe we both asked our readers to answer the SAME question for our giveaways?? I really love the vibrancy of daffodils in the Spring. They are flowering a month late here in UK this year, so they are still around in abundance. That is a great bag pattern and you did a nice job on it. I love seeing the iris blooming in the spring. What a great bag - I love it! I love lily of the valley - mine are just coming into flower! Great bag and it coordinates so lovely with your outfit ;-) Your lilacs are gorgeous ! Can't wait for our lilacs to bloom! Beautiful bag, but mostly I love Sasha! 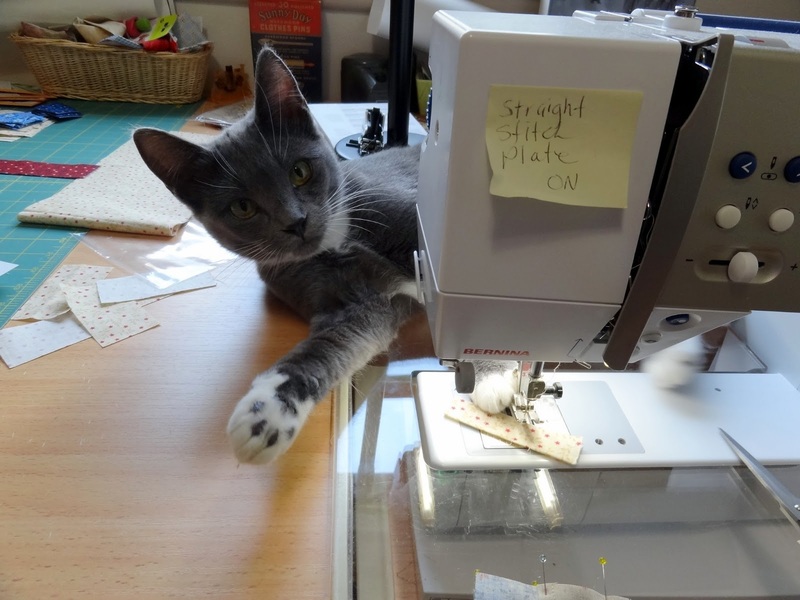 Glad she is such a big help to you in your sewing room! Gerber Daisy is my favorite. Great bag pattern and a generous offering. Your bag is a beauty...you did a wonderful job! I too love lilacs...I have terrible luck with growing them, but finally after years of persevering, have a bush that will produce some early blooms for me...love them. Thanks for the chance! Great bag, love the colors you chose. Lilacs have to be my favorite spring flower. I live a little south of Rochester, NY. Rochester is know for the lilacs in Highland Park. Our lilacs are a little behind yours. The Lilac Festival is always around Mothers Day. 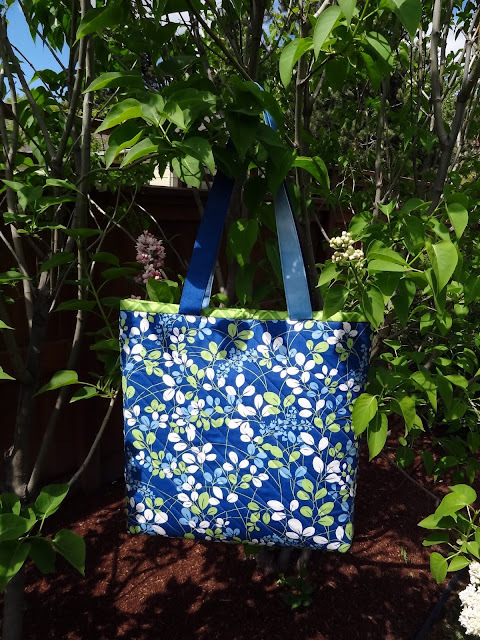 Your bag is so cute and I love the spring fabric you choose. My favorite spring flower is a peonie, they don't last long, but they are gorgeous. I didn't know your area had a LQS, it's been awhile since I've been there, I must check it out sometime soon. The new bag looks so good, I like big bags! My favourite spring flower is the coltsfoot, our first brave wild spring flower, a weed really but such a promise of new life. My favorite flowers are Spring Blossoms. Love your bag! The colors just sing. :-) Daffodils are my favorite spring flower and I always look forward to their blooming. Thanks for the chance! The botanical name for my favorite springtime flower is a long one! It is the ever popular Daffolipcinthlia Violhearteesia Butterlily Lilaris Blossom! My favorite Spring blossoming flower are daffodils. Love how they dance in the Spring Breeze. Also love the look of your Caity Did bag besides the tip of a post it note for a single stitch plate while using your machine, what a handy reminder and a great way to save on both eyes and needles. 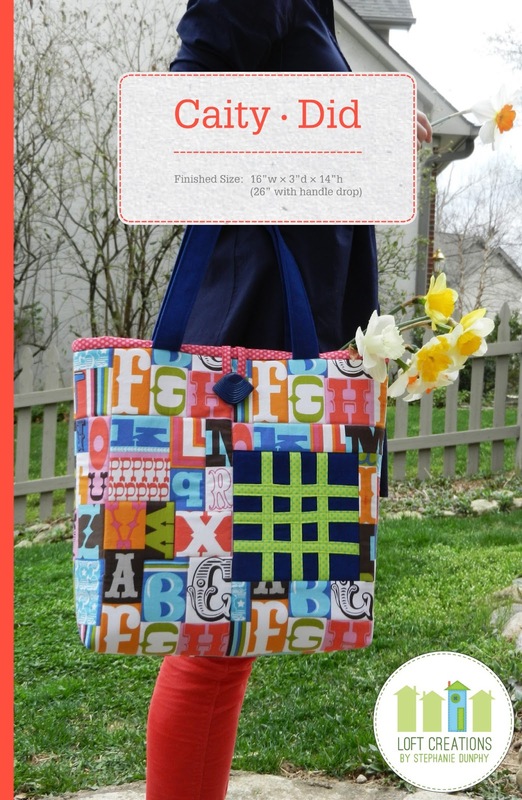 I really like the look of this bag and LOVE the fabrics you used. So happy & springlike. I'm a tulip lover and would be in awe of the hundreds of red tulips I had planted in the front yard of my former house. Incredibly beautiful in spring. I want to eat your bag. It is beautiful. I love your colour combination. Beautiful, beautiful, beautiful. I have come to visit from Loft Creations and I am glad I did. Your blog (and cat) are great. Now, my favourite spring bloom - anything with a lovely scent. I am a shocking gardener, so I am grateful for anything that flowers, but I do love flowers with scent. Thank you for offering a give away. I love your version of the bag! I'm a pushover for florals too! Its very difficult to pick just one favourite spring blooming flower; I love them all!! I love freesias and jonquils because of their perfume. I love daffodils. They are in full bloom here in CT. right now. So pretty. Greetings, Candace! Happy Spring. My daffodils are blooming, and it is so sweet to see your lilacs. Lovely photos. I like your color choices for the tote. A fun fabric I might use is a wild Kaffe floral in blues... Thanks for the chance. Coming over from Loftcreations to visit your blog and admire your bag! Love your sweet Sasha! My favourite Spring flower is a tulip! My favorite spring flower is the hyacinth; adore the scent! Mine are beginning to bloom here is SW Michigan (yay!). Also, need to use your post it note idea re: the straight stitch plate before I break a needle, or worse. Thanks for the opportunity to win this cool pattern! Love the bag and the fabric. I love the colors. Favorite spring flower is peony! Mine is just about ready to bloom. Your kitty is adorable. My kitties like to help me sew also. My favorite spring flowers are peonies. They smell wonderful though I really love lilacs too. I'm so proud of Sasha for deciding to stay and love you. Her fear factor was pretty big, there at the start. I love the bag and hope I win it. I'm so tired of dragging all these WalMart bags around....I should get paid for the advertising, right? Happy spring, Candace. Quilt show this weekend, here. Everyone's sewing like crazy. Very pretty fabric for your purse. And I really like your straight line quilting. I wonder who obeys better as to keeping the fingers/paws off. Evie wants to sit with me at the machine and push all the buttons. It's all just so interesting to her.